Many people have a concrete floor in their basement or garage. 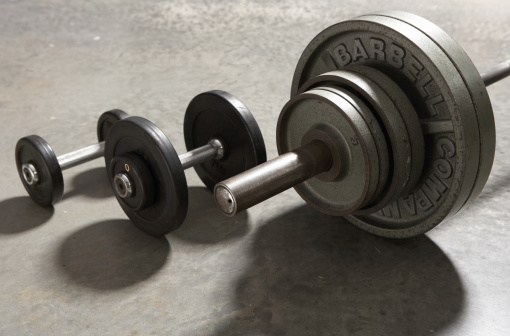 While functional, they are not always durable or attractive. To make your concrete floor last longer and look better, consider finishing it off with paint or a stain. Both are better options than slapping down a carpet on top of the concrete, because stains and paint can take nicks, scratches and spills. Both are also relatively easy to do if you have the right materials and a little patience. Make sure you do not have a moisture problem before you try to paint or stain your concrete floor. Tape a plastic garbage bag to the floor tightly so that no air can escape. Leave it there for at least one day, then remove. If the floor is damp, you have a moisture problem and cannot paint or stain the concrete until this is solved. This may involve moving gutters away from the side of the house, checking windows for condensation or looking for cracks in the concrete. Prepare the area. Cover nearby items with a tarp or old blankets or sheets, especially if you are going to be spraying the paint or stain. Open windows for ventilation, and wear long sleeves and goggles to protect your skin and eyes. Choose your paint or stain. You can choose paint made specifically for concrete or garages, a deck paint or a specialized paint, such as paint that has sand mixed in. Choose two colors and sponge them together for a unique look, or make a border with paint tape and another color. Stain does not cover as completely as paint does, but adds a touch of color to your concrete. Ask to see samples at your local paint store to see the true color of the stain after it has been applied to concrete. Apply the paint or stain. 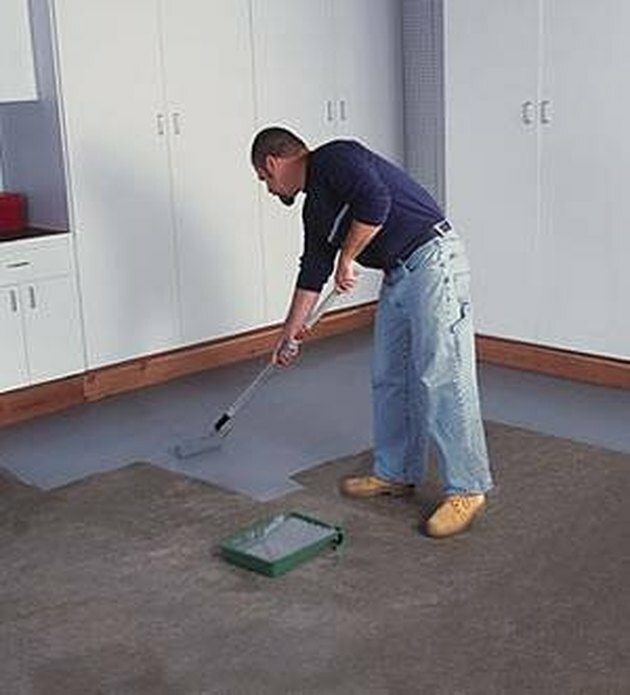 Using the tool of your choice, cover the floor with one coat. Let dry completely, then apply another coat. For paint, you will probably have to apply at least two coats. For stain, it depends on how rich you prefer the color to be. Protect the paint or stain. Once the paint is completely dry, add a layer of varnish or sealer. Depending on your floor, you may want to add as much as four or five layers. The more layers, the more durable the floor will be.